The upper panel of the Drum Page is where you can adjust the tuning, overhead and room microphone mixes for each drum individually. The kick drum has additional controls for adjusting the balance between microphones inside and outside the drum. Similarly, for the snare you can adjust the balance between the snare top and snare bottom microphones. When percussion is selected, you can choose the tambourine, clap, stick hit, shaker and cowbell (for the Open Kit) or maraca and rototoms (for the Tight Kit). The bottom panel lets you choose articulations for the selected drum. For example, selecting the snare drum will give an articulation menu showing the different types of snare hits such as center, halfway, rimshot, flam, roll and others. Each articulation has its own volume envelope, with knobs for 'Attack', 'Hold', and 'Decay'. Each articulation can also be assigned to a MIDI note, allowing you to fully customize your kit mapping. What's more, A selection of drum mappings from other popular software and electronic drum setups are included under the new MAP menu, making it simple to integrate 70s DRUMS into your production flow. The Mixer Page is where you can control the levels of the various microphones. You'll also find the panning, output routing and solo/mute controls here. On the left side are the direct microphone channels with the overhead and room microphones on the right. Each track can also be routed to several outputs using the drop-down menu below each fader, depending on your soundcard and your output settings in KONTAKT. The buttons 'Drums' and 'Percussion' at the top right switch the direct mic controls from the regular drums (kick, snare, hi-hat and toms) to the percussion instruments (tambourines, claps, shakers, cowbells, roto toms, and stick hits). 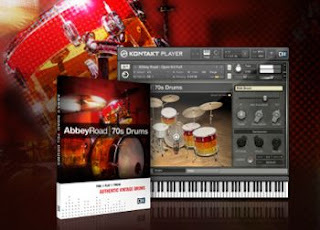 The Options Page includes various parameters that let you fine tune the sound of ABBEY ROAD 70s DRUMS and inject some vitality into your drum tracks. Not only can you make comprehensive adjustments to MIDI velocity curves and playing ranges you can also adjust the volume of the snare bottom microphone bleed - a common sound in acoustic drum recordings. For that extra touch of realism, the parameters of volume, velocity, time, pitch, and EQ may be randomized. In addition, the 'Exclude Direct Mics' option allows the samples of the direct mics to be excluded from the randomization parameters. This lets you impart your drums tracks with subtle, nuances that avoid sounding automatically "randomized".